Hello friends today I’m going to show you life-cycle of Java Applet. 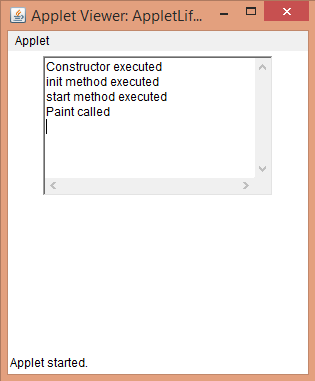 Applet is a Java Program which runs in browser and can also be run and tested using appletviewer command in java. Applet runs in browser that means it is executed at client side. To run applet, client should have Java installed in his/her computer. Applet code is downloaded from web server before it is executed. To run this applet using appletviewer command type appletviewer AppletLifecycle.java in command prompt. To run this applet in browser create a html file and copy commented applet tag code in html file, and open that html file in browser.